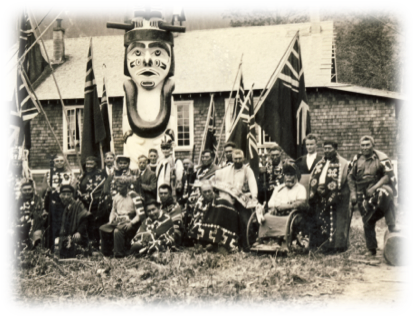 The village of Gwayi – Kingcome Inlet is the main village site of the Dzawada’enuxw and the current population base is about 100-120 depending on the time of year. The total membership of the Dzawada’enuxw is approximately 580 with the majority of members living off reserve. The community is extremely isolated with travel in and out by seaplane or by boat only. 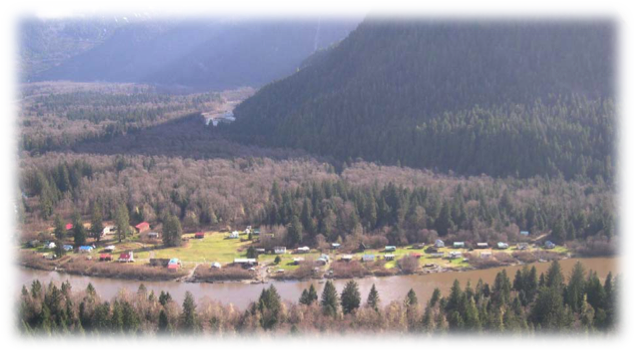 The village is located upriver in the Kingcome Valley; about a 30 minute boat ride from the inlet. All goods must be brought up river by open punt from the government dock in the Inlet where planes and water taxis land. The river is no longer safe for planes to land and there is no dock along the river or near the village. The Dzawada’enuxw Band is the main employer with a staff of approximately 20 people. Logging and Fishing were once the mainstay of the community’s economic base but both industries have decreased to the point that they are almost non-existent. Most of the traditional land has not been developed with the exception of logging which has left its mark. There are approximately 500 members registered. The Dzawada’enuxw have five “legal” reserve sites: Gwayi, Charles Creek, Belle Isle, Kwages (McIntosh Bay), and Kukwapa (Fly Island). The Dzawada’enuxw have never ceded their title or rights to any of the land within the traditional territory. The band has signed a Forest Range Agreement that is in the process of being renewed as it expires in 2012. The community of Gwayi has a church, soccer field, Old Bighouse, New Bighouse, Health Centre, Elementary School, Band Office and approximately 45 homes. The School goes up to grade 7, at which time the children are forced to board out for grade 8-12. Language and Culture is a concern and reviving these has been identified as one of the most important issues. In September of 2010, the community was hit hard by a flood and members were evacuated out of the village with damage of approximately 3 million left behind. About 20 homes took water into the main living space.